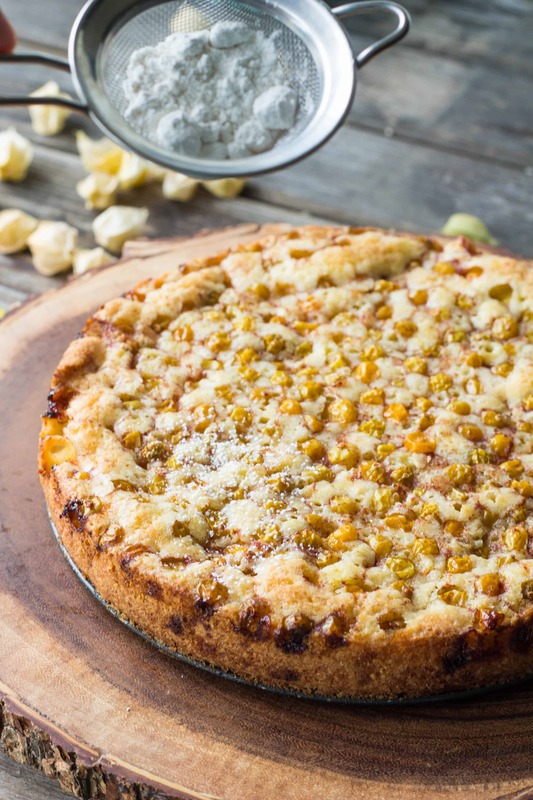 This easy cake recipe uses ground cherries aka husk cherries aka gooseberries! It’s dense and moist and absolutely delicious. I came back from Italy to find my garden looking a bit worse for the wear. Even though I had friends and family members come over to water it and pick tomatoes while I was gone, parasitic insects took over, plants went to seed and weeds grew out of control. Coupled with the 50mph winds we had from the noreaster / hurricane Joaquin combo over the weekend, it’s safe to say my growing efforts are just about done for the season. It’s bittersweet. I love nothing more than picking fresh fruits, veggies and herbs from my garden and bringing them in to cook with, but gardening is a lot of work, and I’m looking forward to getting some of that time back in my day. Well, after I’m done cleaning up this mess of a yard anyway. One of my favorite recent gardening discoveries are these little guys… which go by different names depending who you ask. I bought this plant as a “pineapple tomatillo” last year, and it has since multiplied in my garden like crazy. 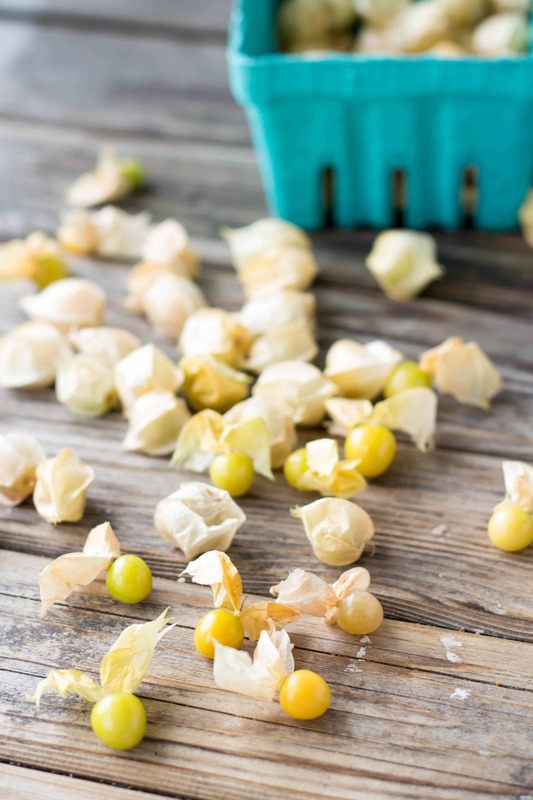 I’m sure there are different varieties, but the more common names for the little husked berries are both “ground cherries” or “husk cherries”. They’re very similar to, although slightly smaller than the cape gooseberry, and are (maybe obviously?) part of the tomatillo family. While this year resulted in what I thought would be a huge harvest, I found many of the fruits to be lacking in both color, flavor and texture. In fact, some of them seemed to either rot on the vine or never completely form in the first place, leaving behind these sad, deceiving empty husks. What was a favorite snack of ours last summer seemed a bit less enjoyable this year, lacking the super sweet tropical flavor that once was. This was the trend for not just the tomatillos, but my tomatoes seemed less sweet and flavorful than usual too. Anyone have any idea as to why? The silver lining to this, however, is that when cooked, the little husk cherries intensify in both sweetness and flavor. 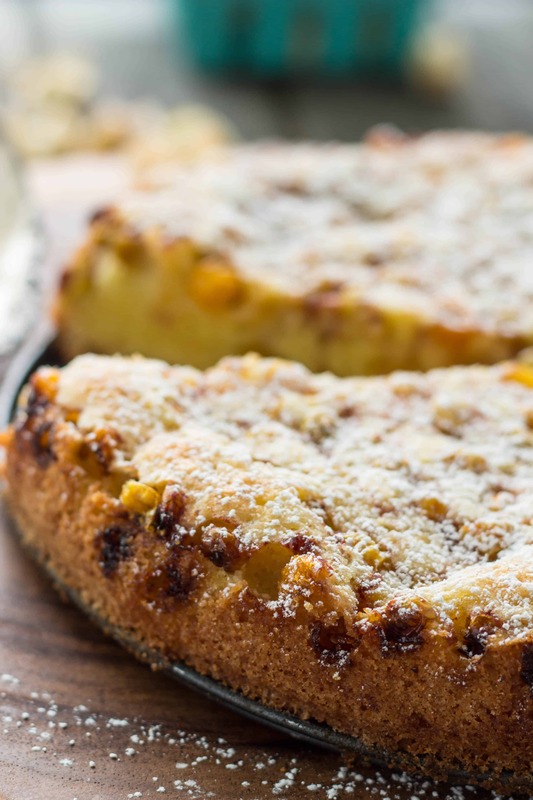 I stole this torte recipe from Smitten Kitchen, who apparently stole it from a lot of different places, because it’s apparently pretty famous. So I guess no one is really stealing anything at all, just sharing the love that is delicious fruit filled cake. 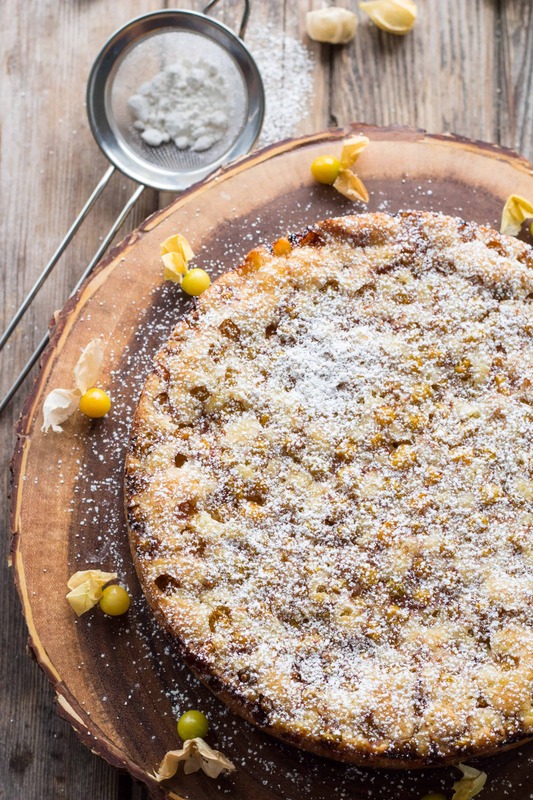 I’m all about this cake because it’s the sort of not-too-sweet dessert that can be acceptably eaten for breakfast, or well, any time of day really. In fact, to my delight, fruit filled cakes just like this were found on the breakfast table quite frequently during our stay in Italy. Italians are so smart. Don’t you always want to start your day with cake? Of course you do. The original recipe calls for plums, and that’s precisely how I made it the first time. The sweet/tart plums nestle so beautifully into the dense, almost sticky cake, and provide the perfect contrast of flavors and textures. It’s an absolute knock-out. I say this, because I’m guessing you don’t have a bushel of freshly picked husk cherries at your disposal. But you might have plums, and if you do, I insist you go ahead and make the cake with them. Seriously. 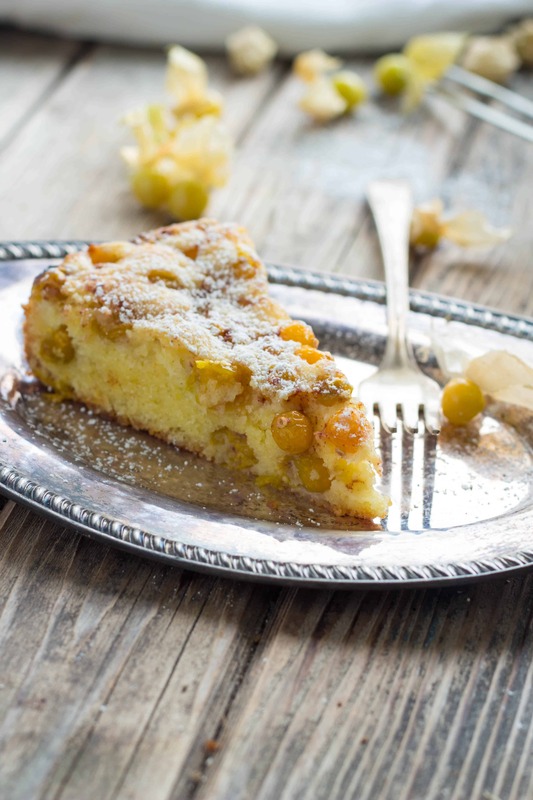 But if you do have access to husk cherries, give this version a try. 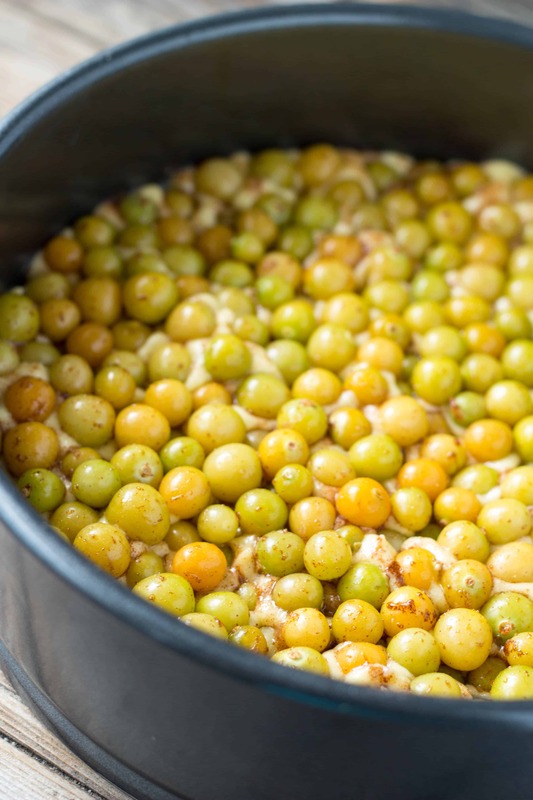 It’s certainly more unique, but when the husk cherries cook down, they almost resemble raisins in their flavor and texture. Did that just turn you off completely? I don’t know too many raisin lovers in my life, but I know a lot of people who despise them. I’m doing an excellent job of selling this, aren’t I? Bottom line, it’s the cake in this recipe that’s the real star. 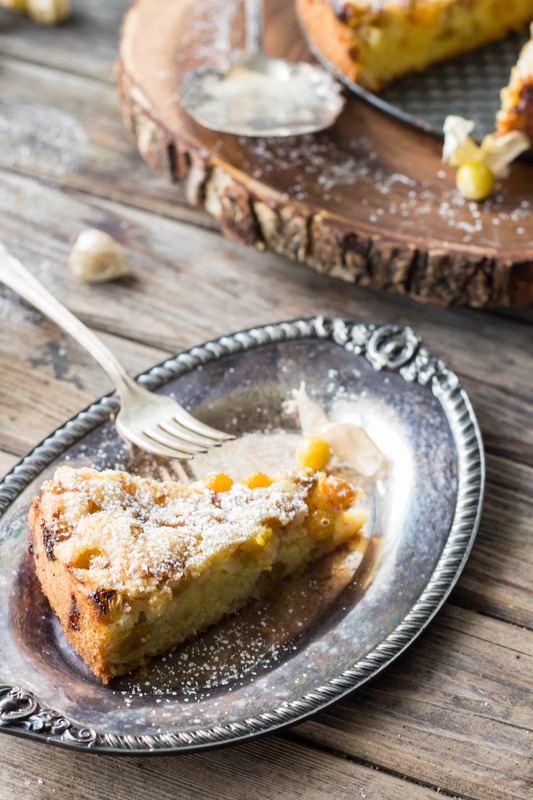 Give it a try with husk cherries, plums, peaches, apples, pears or anything else you think might fit. You never know what might surprise you and become your new favorite breakfast… I mean dessert. Preheat the oven to 350°F and butter the inside of a 9-inch springform pan. Cream together the butter and 1 cup sugar in a medium bowl until light and fluffy. You can use an electric mixer, but I find a wooden spoon and a little elbow grease to the job just fine. Add in the eggs, one at a time, making sure each is fully incorporated. Sift in the flour, baking powder and salt, then mix until just combined. Spread the batter into the pan and smooth the top. Combine the husk cherries,1 tablespoon sugar, lemon juice and cinnamon in a small bowl, then pour over top. Use the back of a spoon or your fingers to gently press the fruit into the batter. Bake for about 45 minutes, or until the cake is golden brown and a toothpick inserted into the center comes out clean (of batter, that is, fruit pulp is cool. ) Allow the cake to cool on a rack for at least 30 minutes prior to cutting. Serve warm. The cake is also excellent served cold after chilling in the fridge overnight. I live down the street from you and had the same problem with my tomatoes. There was an article in the Press back in Aug. that said it was caused by too much rain in June & July. So much rain packed the soil so tight around the roots is what caused the problem. 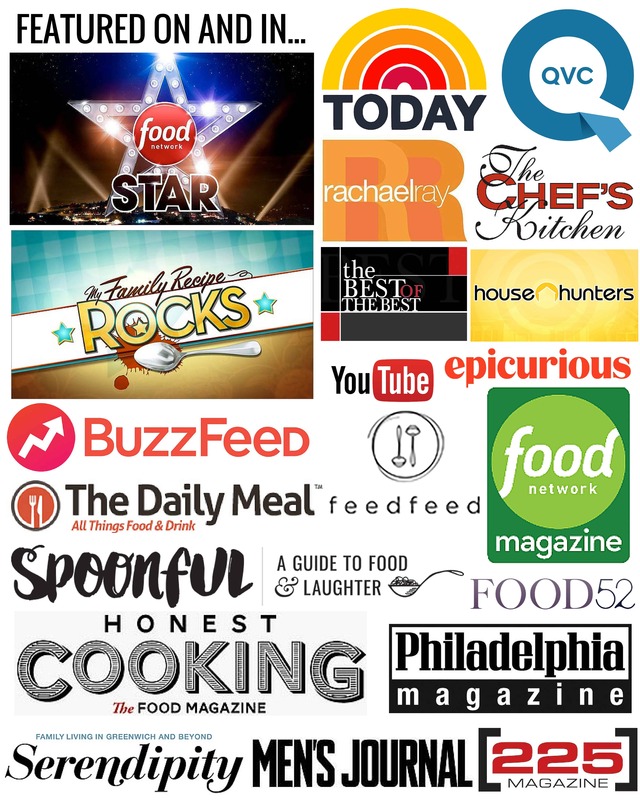 We enjoy your website and your recipes. Our fav so for is the sweet potato hash. Thanks, Don! That’s so interesting. I don’t recall June and July being unusually rainy, but it makes sense. I’m so glad you enjoy my recipes, and especially the sweet potato hash!! I just made this and used gluten-free flour….so delicious! Mmm thanks for sharing! THIS IS DELICIOUS! I found Ground Cherries at our Farmers Market with my dad, who hasn’t had them in years. I’ve made this several times already and passed on your recipe. Thank You! !